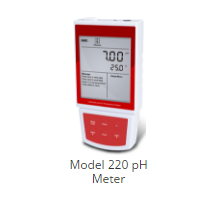 Model 220 pH meter. Features a super large LCD display (back-lit on the Model 221) with written instructions and helpful prompts for calibration and operation. Without doubt the simplest pH meter we have.This budget series of meters (models 220, 221) are for the measurement of acidity and alkalinity in liquids. The microprocessor-based meter is very economical and easy to use.